I’ve wanted to make chilaquiles for awhile but was a little overwhelmed by the choices. I love the precision of cooking and there was no set way to go about making these. The tortillas can be fried or baked, topped with chicken, chorizo or eggs, sprinkled queso fresco or Cotija, sauteed or covered on Oaxacan cheese then baked, the sauces can be red or green or mole, the peppers fresh or dried. Elbow deep in books and online recipes, I saw a an opportunity to throw in some staples that I overbuy but under use testing the tips and side notes that the cookbook obsessed pick up and file away. They can be a breakfast or brunch dish, a perfect way to use leftover tortillas, and a sometimes cure for hangovers. A generous dish. With no set path, there was no way to fail. This recipe is adapted from Diana Kennedy’s The Essential Cuisine of Mexico based on a recipe from Señora Josefina Velázquez de León. I chose this version of chilaquiles to start with because I have a weakness for any recipe that starts with making your own broth. While I think I have wherewithal to make large batches of stock to store and use as needed, I know for a fact that my packed freezer does not. I thought I had everything when I started but had to replace dried Ancho chile with a Poblano pepper. 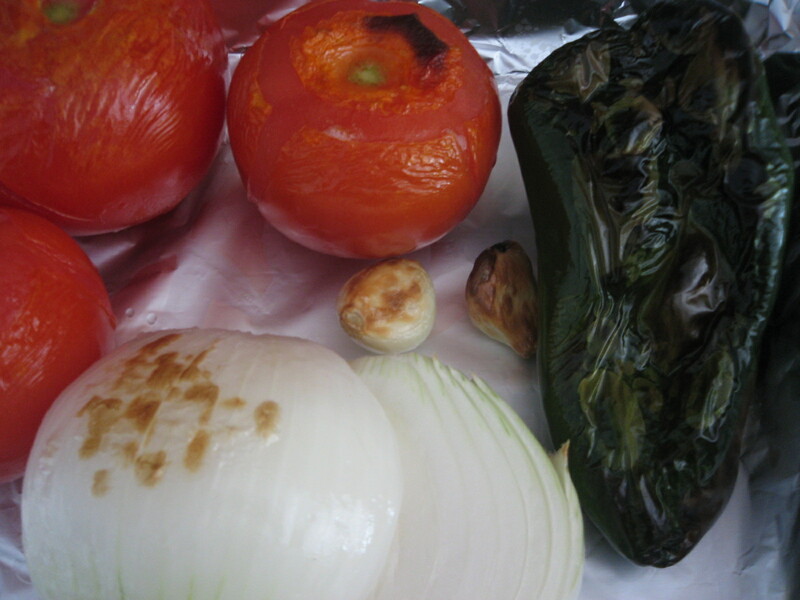 I tried the recipe a second time with the right chile and found that I missed the freshness of the Poblano. I’ve included it in the version below. Drizzle tomatoes, garlic and pepper with one tablespoon of canola oil. Place under a broiler until lightly charred, about 6 minutes. Place pepper in a plastic bag for 5-8 minutes so that the steam will help loosen the skin. When cool enough to handle, peel and stem the pepper, removing seeds. Combine tomatoes, garlic, peeled pepper, and water in a blender and process until smooth. Heat remaining tablespoon of oil until hot but not smoking. Add sauce and bring the mixture to a simmer, about 5 minutes. 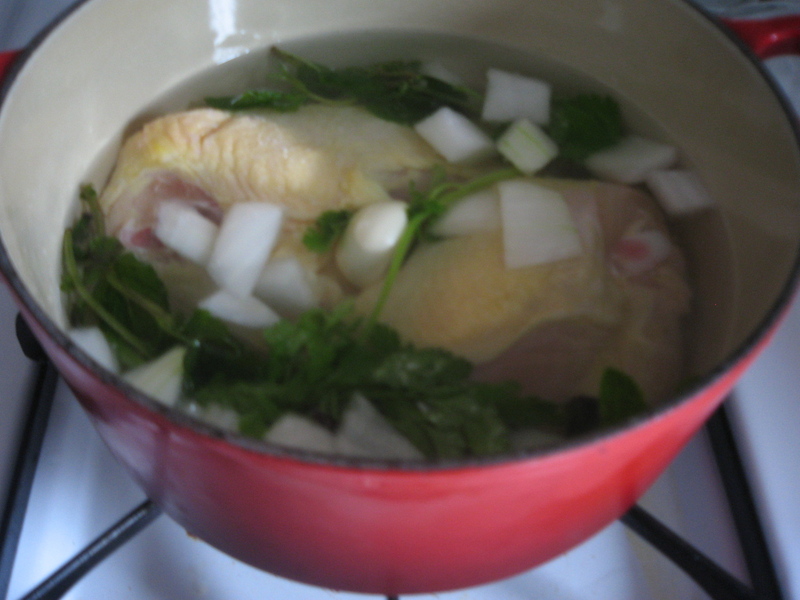 Add the chicken broth and continue to cook an additional 3 minutes. Adjust the seasonings and remove from heat. 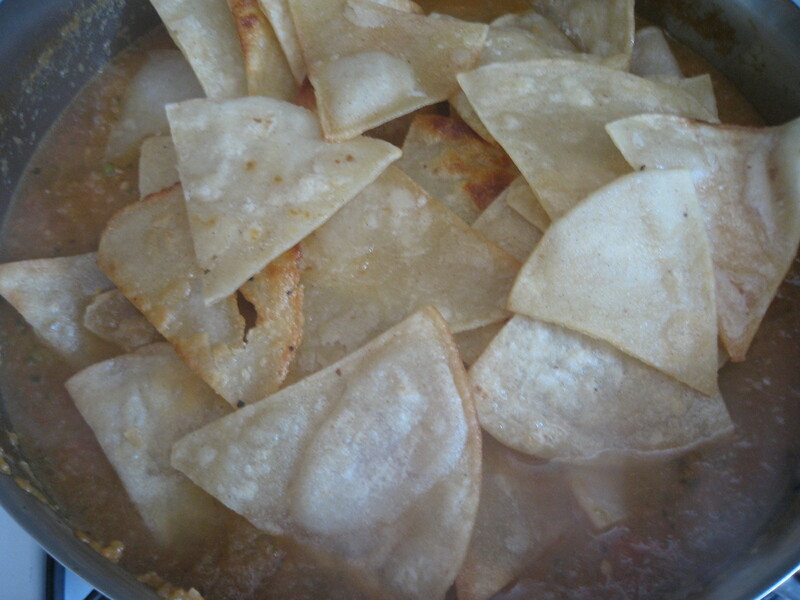 Return sauce to a boil and stir in tortillas. 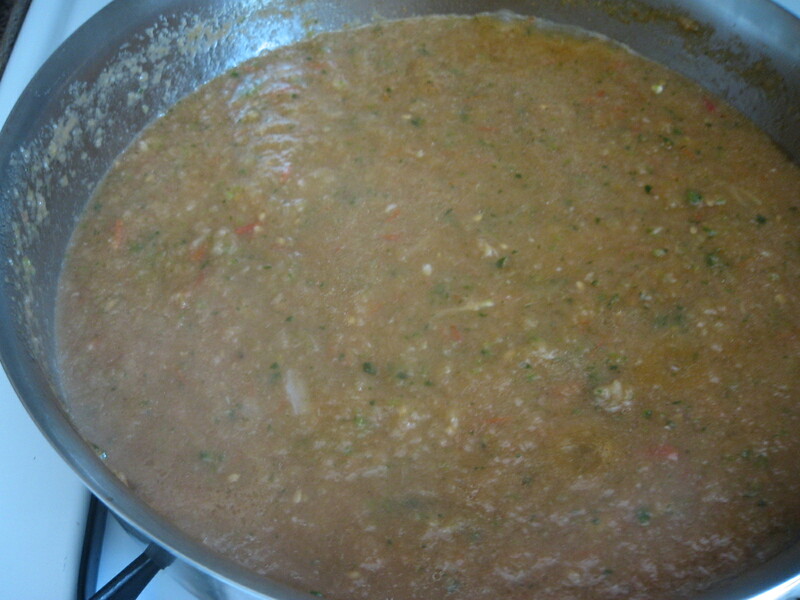 Cook over medium heat, stirring constantly, until most of sauce is absorbed, about 5 to 8 minutes. 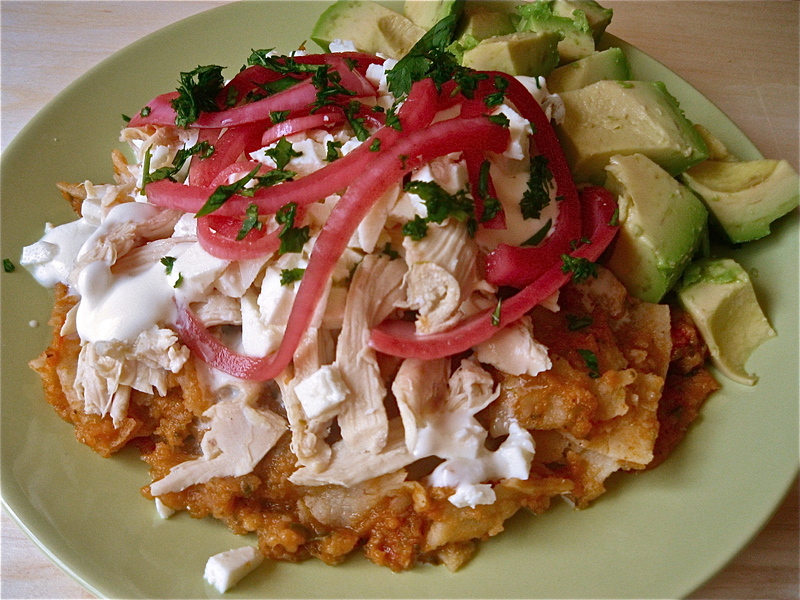 Serve the chilaquiles with queso fresco, sour cream or Mexican crema, shredded chicken, chopped avocado, onions and cheese. 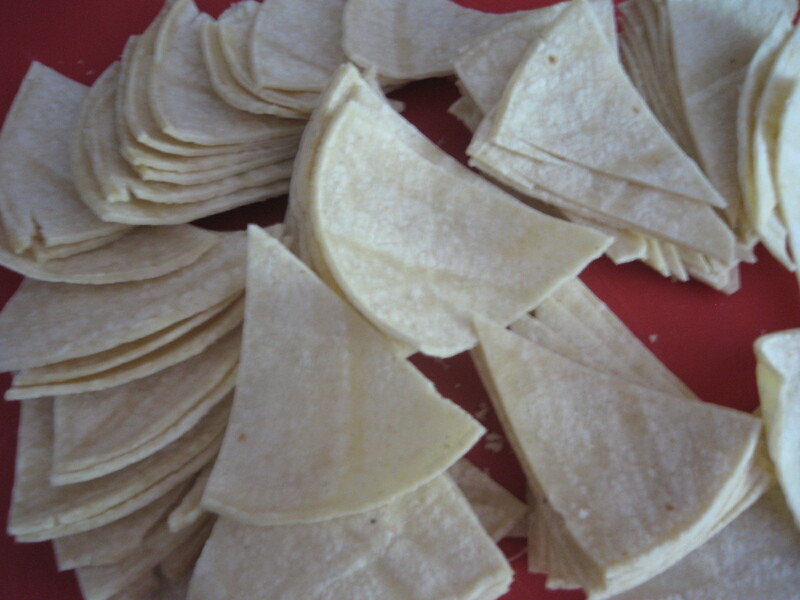 I’ve recently become addicted to making my own totopos (or tortilla chips) as a way to use that leftover corn tortillas that only seem to sell in sky-high stacks of 50 and alternative to store-bought chips. If the tortillas are left to dry out (overnight if possible) and the oil is brought to the right temperature (about 375 degrees), they will not take on excess oil. However, if you’d like to cut out the oil altogether, the wedges can also be baked at 350 degrees for about 40-50 minutes. 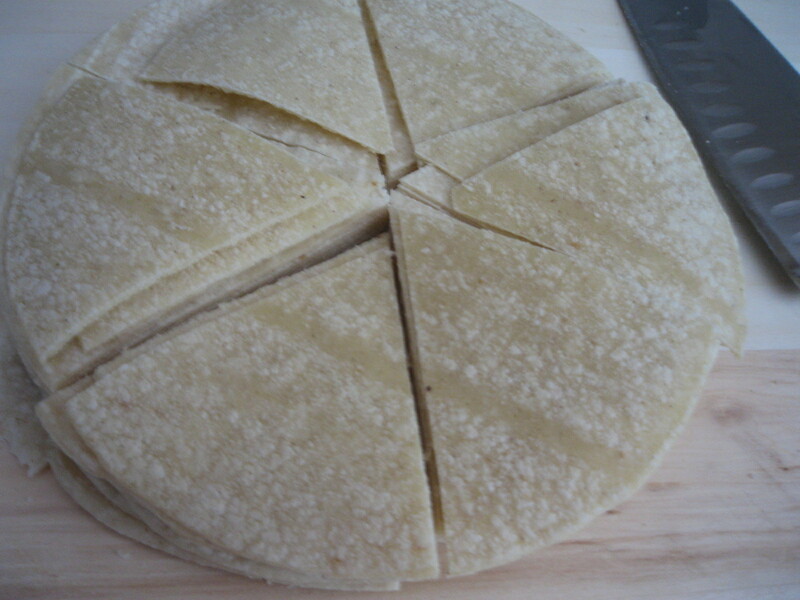 Times may vary depending on the the thickness of the tortillas so they should be checked and turned frequently. I pride myself on going far to get the right ingredients but good crema is often just out of reach. Buttermilk and heavy cream, however, are two ingredients I can’t use fast enough. I followed Diana Kennedy’s suggestion and tried Julia Child’s crème fraîche recipe from Mastering the Art of French Cooking, Vol. 1 which surprisingly had just the right pourable consistency. In a small saucepan, combine buttermilk and heavy cream. Heat to no more than 85 degrees then pour in to a glass jar and set out 5 to 8 hours until thickened. Stir and refrigerate. Note: Another option is to add milk to sour cream, one tablespoon at a time, until it reaches the right consistency. While I like the acidity of pickled onions, I have to admit that I’m really into it for the color. 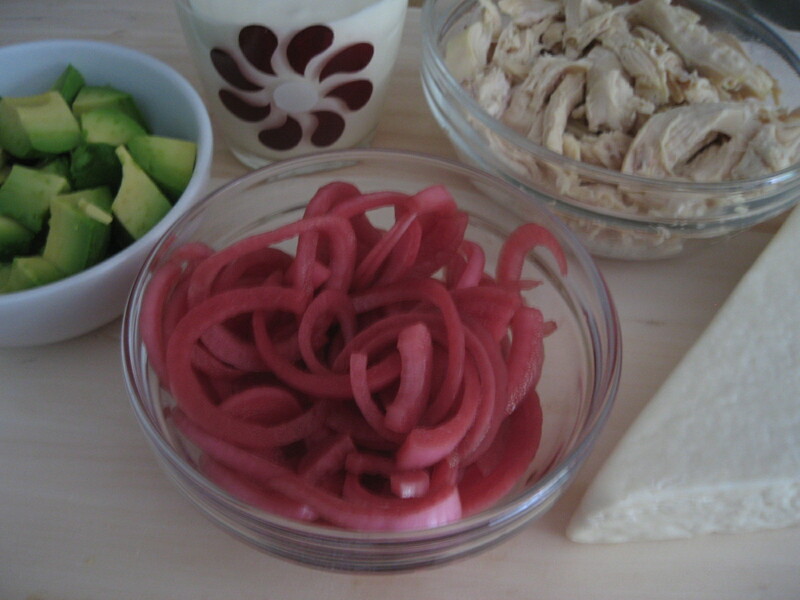 In Simply Mexican, Lourdes Castro suggests submerging red onions in red wine vinegar. Left to marinate overnight, they’re my go to topping when I need a little pink. I would buy bags of ur Totopos!!! Chilaquiles is one of my go-to options when dining out Mexican style. These look wonderful, especially with those bright pickled onions on top. Where did you get the adorable glass used to hold the sour cream? Thanks! Thanks, I’m happy you’re enjoying it! I found the glass at Bopkat Vintage in Brooklyn. It’s a real sour cream jar from the 60s when they used to sell it in glass jars like jam. I was in the middle of my home sour cream experiments when I found it so of course had to have it. Your photos are terrific, too…..